JACKSONVILLE — Adam Gold canoes for his research. It’s the dream, right? Slicing across the surface of the water, dipping the paddle with a gentle splash, answering questions from neighbors flabbergasted to see someone canoeing a 30-foot-wide stormwater pond … OK, so maybe it’s a dream only a stormwater aficionado could have. Gold has loaded up his lab’s canoe a few times over the last several years as part of his research on stormwater dynamics at U.S. Marine Corps Base Camp Lejeune in Jacksonville. Thanks to those canoe trips, he’s learned that stormwater ponds may be changing water quality in exactly the opposite way as expected. 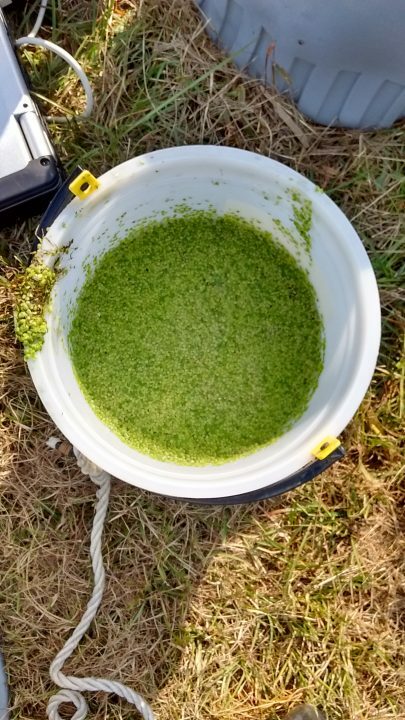 “We found a lot more net nitrogen fixation in stormwater pond sediments, which is the addition of nitrogen, rather than the removal,” said Gold, a doctoral student in Michael Piehler’s lab at the University of North Carolina Institute of Marine Sciences in Morehead City. 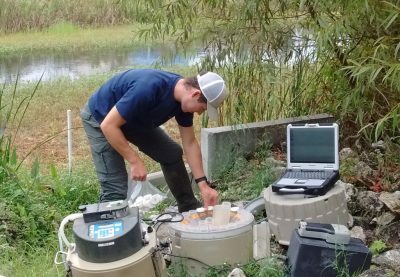 His research may be the first to directly measure nitrogen cycling in stormwater ponds in the coastal Southeast, and the findings could influence landscape planning in the region. 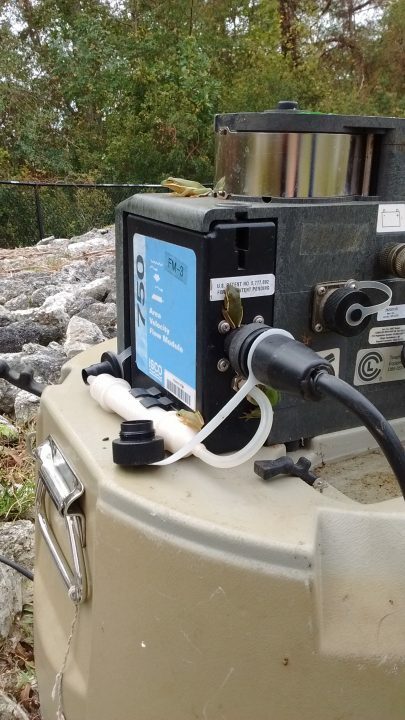 “Adam’s research reminds us that conventional approaches to management — and in this case stormwater — aren’t always providing the functions we assume they are, and it is important to continuously challenge and seek to improve those management efforts,” said Susan Cohen, a Navy biologist. 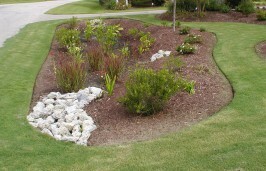 Stormwater ponds are built to help control the water that rushes over hard surfaces when it rains. As stormwater moves through a landscape, it accumulates nutrients like nitrogen from sources such as fertilizer and animal waste. Stormwater ponds are expected to help reduce those nutrient loads. As Gold, Thompson and Piehler recently reported in Ecological Engineering and Science of the Total Environment, they found that stormwater ponds were in fact adding nitrogen during the summer. To understand the researchers’ surprise, it’s useful to take a quick tour of the nitrogen cycle. Nitrogen is found in multiple forms. 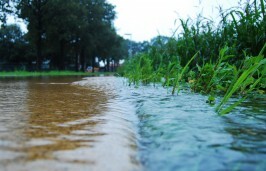 Stormwater delivers nitrate and ammonium – two forms of nitrogen – from land to waterways, where it can be taken up by algae. If nitrate and ammonium concentrations are high enough, algae can grow rapidly. This can create an algal bloom that decreases oxygen concentrations in the water and threatens aquatic life. Algal blooms can also impede recreation and pose human health concerns. Because excess nitrogen can have such devastating effects on water quality, environmental managers strive to reduce nitrogen loading to waterways. They also try to maximize habitats that encourage denitrification, a natural process that converts nitrate to nitrogen gas that cannot be used by algae. According to Thompson, stormwater ponds are expected to be ideal environments for denitrifying bacteria because they have plenty of carbon and low oxygen concentrations. Gold’s research methods allowed the team to observe stormwater pond nitrogen dynamics in real time. 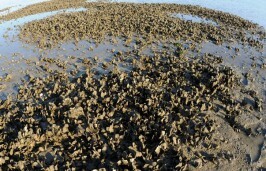 “In our case, we’re directly measuring what’s occurring (to nitrogen) in the pond,” Gold said. What they found was not nitrogen removal but addition, through the process of nitrogen fixation. In other words, bacteria in the ponds were converting nitrogen gas from the atmosphere into ammonium. To measure nitrogen processes, the team collected mud and water samples from the stormwater ponds at Camp Lejeune. Paddling out in their canoe under a summer sun, they filled plastic carboys with pond water and used a modified pole to collect sediment cores from the bottom of the pond. Back in the lab, sediment cores are connected to a pond water incubation system. Photo: Adam Gold. “You have a plug of sediment inside of an acrylic tube that we can then bring back to the lab and incubate to look at nitrogen cycling within that portion of sediment, as it interacts with the water column,” Thompson explained. The researchers used equipment that enabled them to calculate rates of denitrification and nitrogen fixation by measuring changes in dissolved nitrogen gas concentrations. 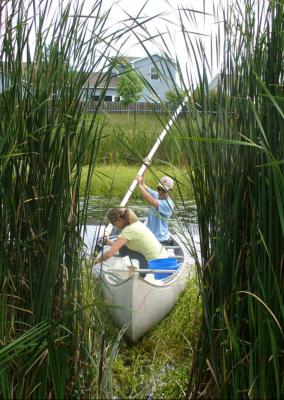 They were surprised to find that ponds were increasing useable forms of nitrogen during the summer, and that older ponds had higher rates of nitrogen fixation. “That was very surprising to us, that these ponds were kind of doing the exact opposite of what everyone hopes and expects that they would be doing,” Thompson said. Environmental fieldwork sounds glamorous, calling to mind leafy forests or sparkling lakes. The Camp Lejeune stormwater ponds resemble a less photogenic combination of those landscapes: leafy lakes. So how did stormwater ponds steal the spotlight? 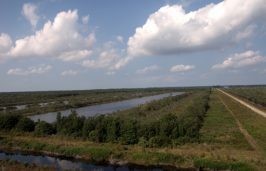 Camp Lejeune drains into the New River estuary, which prompted the Department of Defense to fund research on management strategies to keep the estuary healthy. 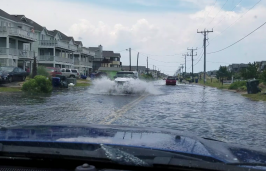 Scientists studied the land-water connection at the base for more than 10 years through the Defense Coastal/Estuarine Research Program, or DCERP, which recently concluded. The opportunity has been invaluable for scientists as well. The Piehler lab started studying Camp Lejeune streams in 2008. A year later, the base began renovating a neighborhood in part of their study area. Gold explained that land was paved, soil was compacted and stormwater ponds were added to control runoff. “The fact that basically the entire watershed was being drained by these stormwater ponds kind of flicked on the light bulb,” Gold said. 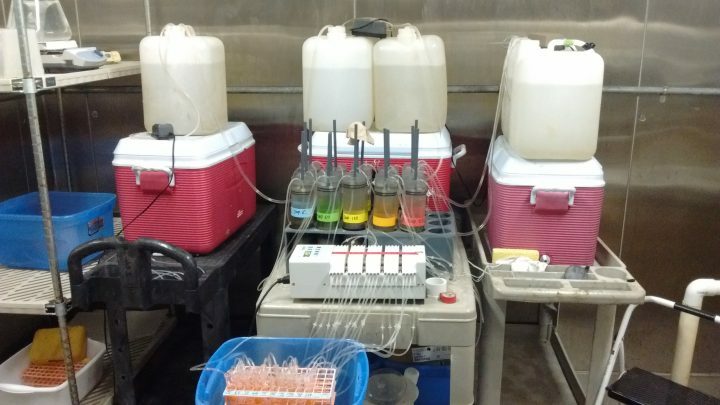 Since stream water quality had been monitored before, during and after the development, the team had an opportunity to evaluate how stormwater ponds affected nitrogen dynamics in the watershed over time. 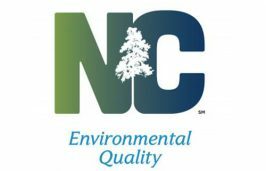 The Camp Lejeune stormwater ponds can offer insight into managing stormwater ponds in the coastal Southeast for nitrogen cycling. Ongoing work in the Piehler lab suggests that the findings likely apply to other local stormwater ponds. “Since then we’ve continued sampling ponds around Carteret County, Morehead City and Beaufort, and we’ve found the same results basically: really high rates of net nitrogen fixation,” Gold said. The lab is sampling year-round to identify seasonal trends in nitrogen fixation. The researchers suggest that one way to limit nitrogen fixation during the summer is to run aerators, which mix stagnant water and distribute oxygen. Ponds could also be excavated more frequently to clear out dead plant matter. Excavation might rejuvenate older ponds, preventing them from reaching the high rates of nitrogen fixation observed in Gold’s study. Base officials are expected to consider these suggestions as they revisit stormwater management plans. Gold cautioned that it might be most useful to think carefully about the purpose of a stormwater pond before installing one. He explained that stormwater ponds are primarily designed to decrease erosion and reduce the amount of sediment that reaches streams. If nutrient removal is the main goal of a pond, Gold recommends first applying low-impact development principles and educating residents about issues like fertilizer application. “Those are all things that you should probably try before putting in a stormwater pond,” he said. Their work stands to have widespread relevance, because stormwater ponds are ubiquitous. In most cases, though, he doesn’t canoe them. Author note: Kathleen Onorevole conducted her graduate research in the Piehler lab but was not involved in the study described in this article.